Love to travel on the cheap? When we're not hunting down great prices for rental cars, we like to seek out inexpensive airfares. While there are scores of resources out there to help find cheap flights, we keep returning to trusty old Priceline. Priceline became famous for its heavily-advertised opaque deals, especially its "Name Your Own Price" bidding (which they don't do for flights anymore) and their newer Express Deal offerings. These deals are called "opaque" because you don't know the details of what you're getting until after you pay. These prices might be discounted from regular airfares, but to be honest, you can find better deals on other sites. What you may not know is that Priceline is also a regular online travel agency (a.k.a. OTA) that can book any ordinary retail fare that you find on other sites. You can usually find the exact same fare on other OTAs like Expedia or Orbitz, or even by booking directly on the airline's own website. There are benefits, though, of booking through Priceline. Four factors that set it apart from the pack include the most generous cancellation policy in the industry, the most generous cashback bonus on the Internet, good customer service (if you use the right channel), and convenient itinerary management. In 2013, the U.S. Department of Transportation mandated that domestic air carriers must offer customers either the ability to hold an airfare for 24 hours before purchase or cancel a ticket within 24 hours of purchase. Most carriers have opted for the latter. This requirement doesn't apply if the ticket is purchased within seven days of travel, but most carriers haven't chosen to treat those cases separately. The DOT only required airlines to honor this for tickets purchased directly, not through travel agents, but many large online travel agencies have instituted their own 24-hour cancellation windows in order to remain competitive. Priceline goes above and beyond the 24-hour cancellation window, though.You can cancel up until 11:29pm Eastern time on the next business day. That means that if you buy a ticket just after midnight, you actually have almost 48 hours to cancel for a full refund. Even better: Priceline's rule pertains to the next business day. So if you buy a ticket at 12:01am on Friday morning, you can cancel anytime until 11:29pm on Monday. That means you can get almost a full 96 hours to consider your plans and cancel for a full refund. On top of that, Priceline's system doesn't enforce the seven-day exclusion. If you book a ticket on JetBlue's website within seven days of departure, the normal 24-hour cancellation policy doesn't apply—but if you use Priceline, you can still cancel for a full refund by 11:29pm the next business day. This is a nice little loophole around JetBlue's restriction. The only airlines Priceline excludes from this cancellation/refund policy are Frontier and Spirit. Those airlines have required Priceline to follow the DOT requirements much more strictly. If your travel is seven or more days in the future, you have 23 hours and 29 minutes to cancel for a full refund, and if you book within 7 days of travel on either of those carriers, there's no available refund at all. When you're taking advantage of an error fare, time is of the essence, because the airlines can discover it and yank availability at any time. Once you book and pay for an itinerary, feel free to start looking for something that works better. It's nice to have an extra security blanket of being able to change if you find a better fare or a flight that works better with your schedule. How does $5 off of every airplane ticket you book sound? It sounds like free money to us and it literally takes 10 extra seconds. You might have seen ads on TV about "getting paid to shop." These so-called "cashback portals" take advantage of affiliate relationships with online stores. These are the same affiliate relationships that your favorite website or blog uses when it refers its readers to partner shopping sites, but instead of the money going to an author online, the cashback portals give it back to you. There are several cashback portals out there. 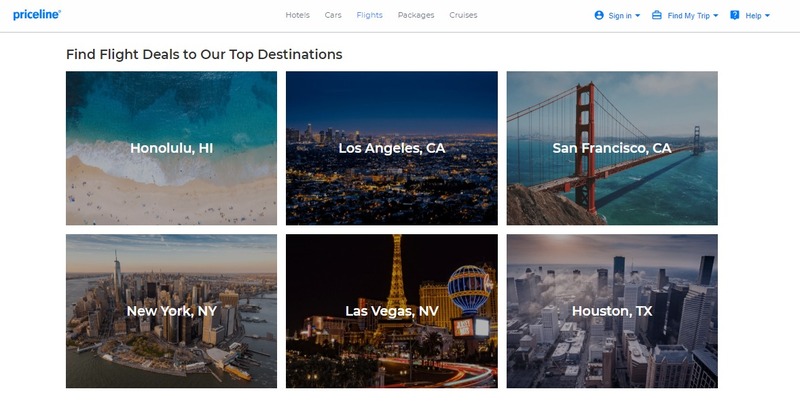 CashbackHolic is a good index of options, and we find that TopCashBack consistently has the best offer for booking an airline ticket through Priceline: a flat $5 back. Unless you're booking a ticket worth $500 or more (where another cashback portal may offer a percentage-based cashback), this is the best option you'll find. The $5 is earned per ticket, meaning that if you book an itinerary with four passengers, you'll get $20 back. And if you can swing booking your trip as two one-ways, you can double that to $40. It takes a couple minutes to sign up for an account on TopCashBack, but (click here to get started). Then search for Priceline, click the big red "Get Cashback" button. Once it takes you to the Priceline site, anything you book will credit to your TopCashBack account. Priceline is a giant company and if you use the customer service phone number, you'll get a helpful agent (usually based in the Philippines) who is only really good for simple questions or changes. When things get more complicated, though, try Priceline's social media channels, and specifically Twitter. We have found that a direct message on Twitter can deliver an agent who responded quickly and competently. Priceline lets you save profiles with the your details and the details of travel companions, including your full name, date of birth, Trusted Traveler number (if you have one, you can get TSA PreCheck benefits on your trip). It's a lot faster and easier to select your name from the menu instead of having to type everything in each time you book a ticket. If you fly JetBlue, book directly on JetBlue.com, because you get more TrueBlue points for doing so. Booking through a third-party travel agency earns half as many TrueBlue points as booking directly with JetBlue. Some of the low-cost carriers like Allegiant, Spirit, and Frontier may show lower prices on their own websites, or they may offer discount coupons that only work on their own sites. Southwest only shows their fares and availability on their own website. When you have a mistake fare or a complicated itinerary, sometimes it doesn't price out correctly on all the booking sites, including Priceline.